Train services between Motherwell and Cumbernauld are back to normal following signal problems earlier this morning. The signal in question was about 30 yards off the north end of platform three at Motherwell and workmen could be seen looking at it by commuters. 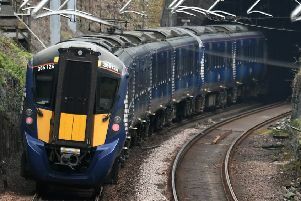 Scotrail had suggested disruption could last until around 2pm through its live travel updates portal, but has now confirmed on Twitter that repairs have been carried out and services are running normally. This is still some disruption to watch out for on the Milngavie-Cumbernauld route as due to repairs being carried out in a tunnel services heading towards Glasgow Central won’t stop at Anderson until approximately 1pm. If your journey was delayed by 30 minutes or more see ScotRail’s http://www.scotrail.co.uk/plan-your-journey/our-delay-repay-guarantee|Delay Repay|DR} guarantee.